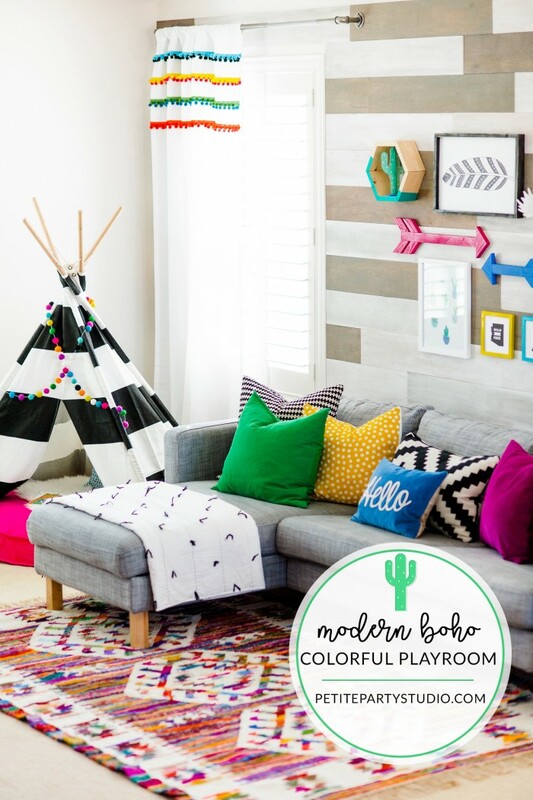 We are so excited to finally share our Colorful Playroom Design with The Land of Nod!! 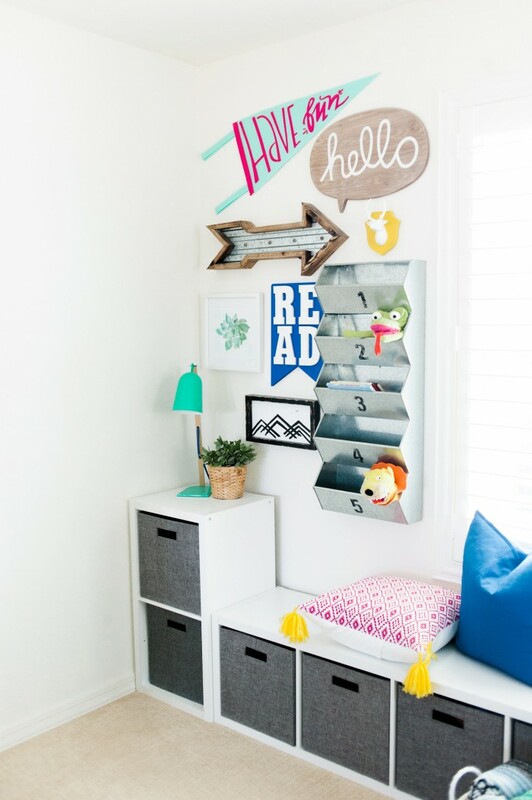 The Land of Nod is a definite FAVE for furniture and decor…their entire site is bursting with colorful, functional and fab finds for your kid spaces. 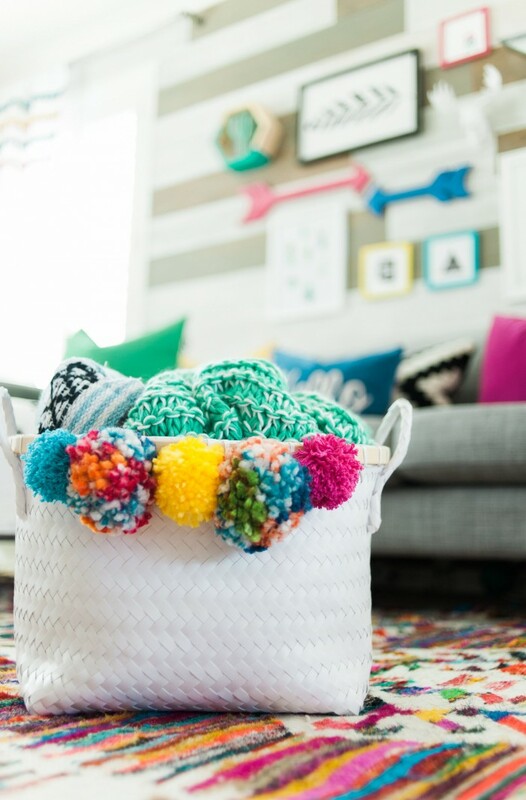 I have 3 kiddos and something that has always been important was having a space that the kids can play, explore, relax and learn…and don’t forget colorful! When we moved into our new home a couple of years ago, I knew that the loft area would be assigned to my littles. I try to keep toys out of their bedrooms for various reasons and loved the fact that our new home had a space that I could utilize for them. When designing any space, it is always a good idea to have a jumping off point of inspiration. When I laid my eyes on this dreamy Casablanca Rug, it was love at first sight! 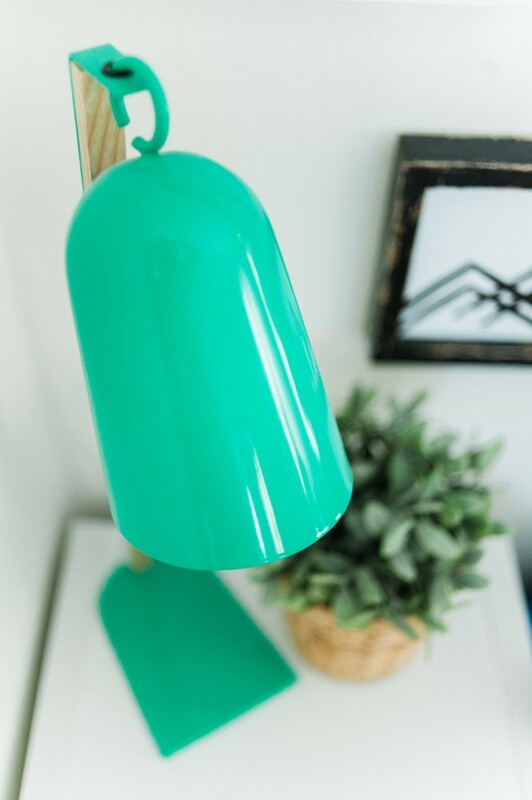 The colors, texture…EVERYTHING about it was perfect for this space. 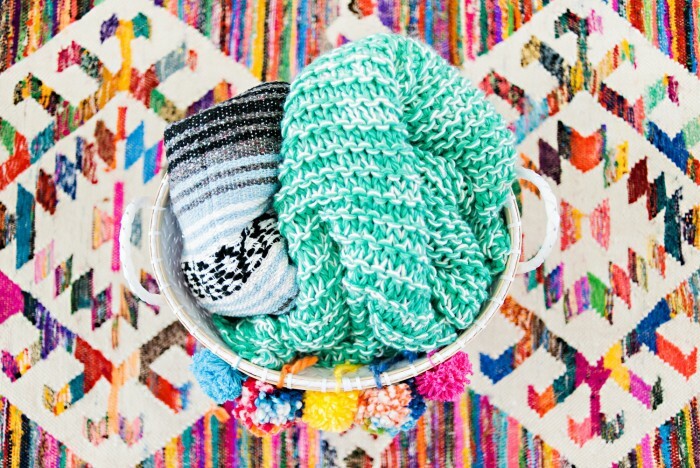 I love color and I’m not afraid to use it. 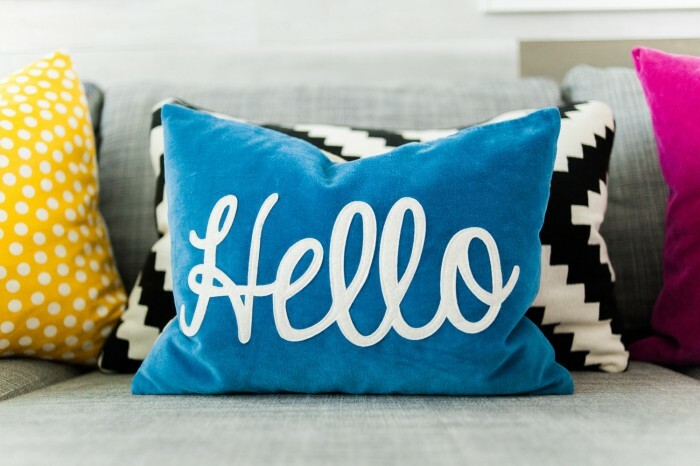 I had been eyeing up this Hello Pillow and knew that was the next item to build the color palette of off. The rug was used to define the center of the space, we already had a neutral gray sofa that was perfect for family movie nights and maybe an quick afternoon snooze. So, I filled it up with colorful comfy pillows and that darling “Hello” pillow was the perfect finishing touch to tie it all together. The wall behind the sofa came next (I’ll be sharing the plank DIY too). I really wanted to add interest to the main wall so I opted to create my version of a DIY plank wall. 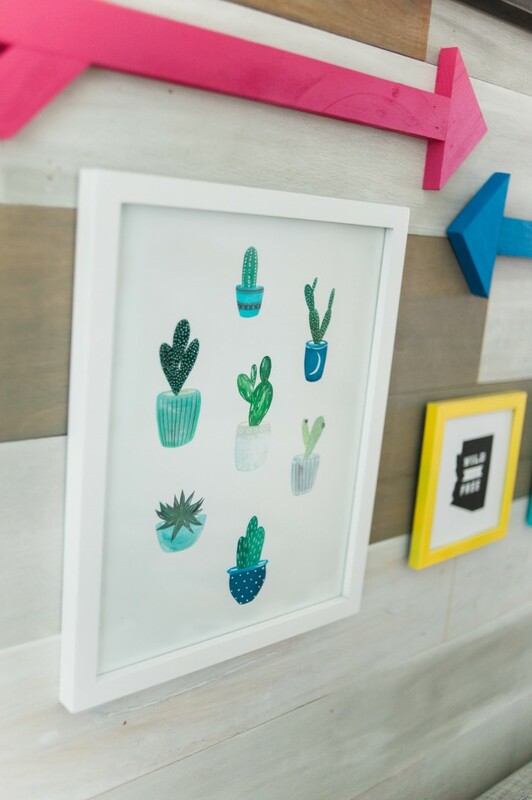 I definitely have a love for gallery walls and this Cacti print was the first piece I used to build the theme. 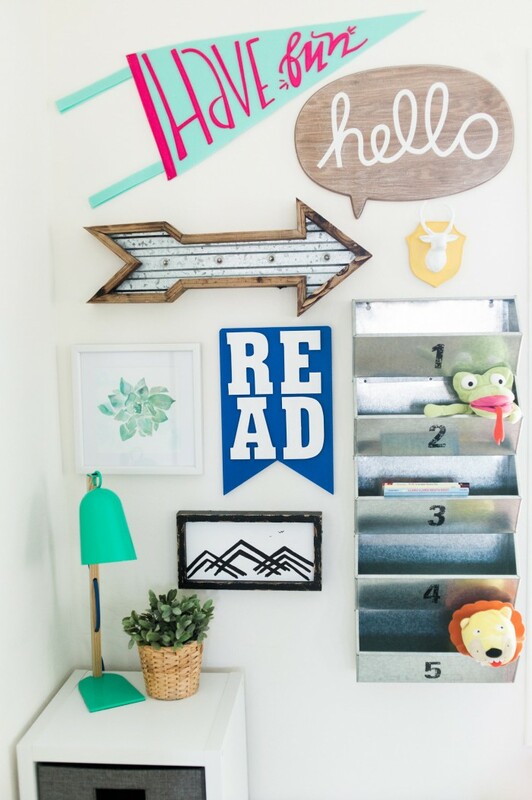 One of my goals in designing the space was to have defined areas…this next area wall all about reading. I used some storage cubicles to create a reading nook and the Take Five Wall Bin was the perfect storage solution for our little library. 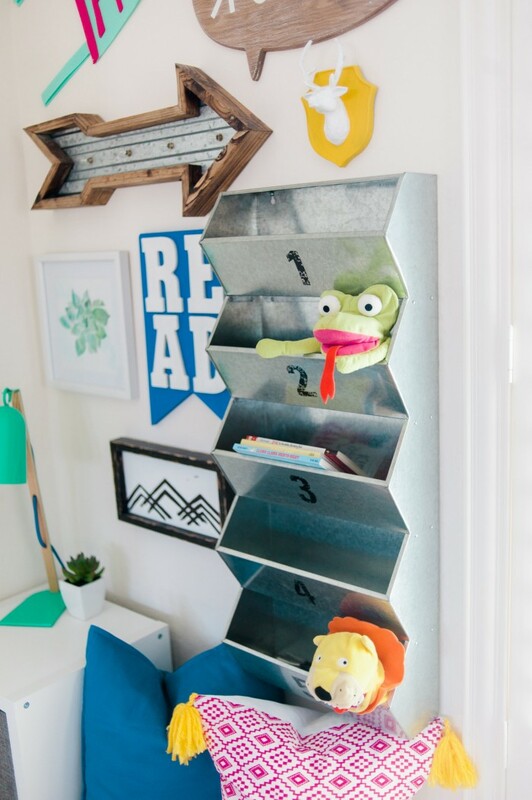 The boys use this wall bin to hold the books they are currently reading or have checked out from our local library so they don’t get mixed in with the rest of the books. 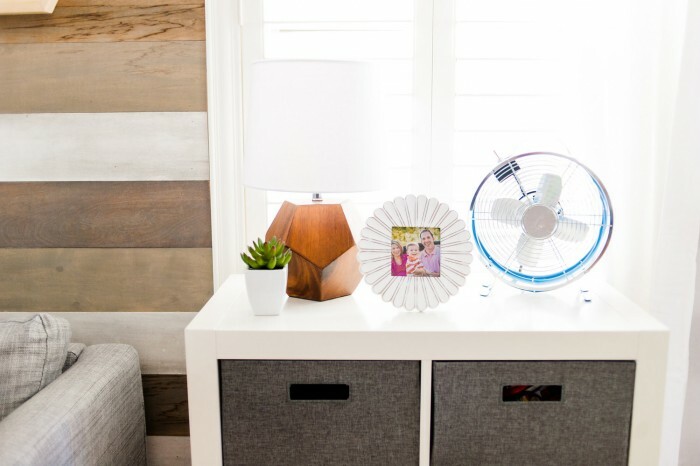 This Mixed Media Table Lamp was the perfect colors for this quaint corner & it casts the right amount of light for a nighttime reading session. Having this wall bin also allows me to organize books by reading level seeing that all 3 of my boys vary quite a bit. The next area | zone that was important for the space, was an area to play. 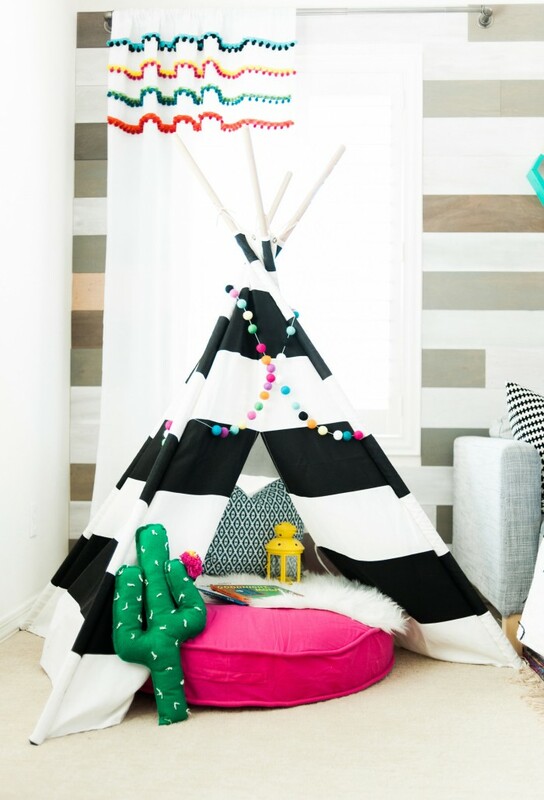 This black and white striped teepee paired with the hot pink Floor Cushion were the PERFECT pieces to put in the corner for a little imaginative play. When this arrived, my boys went nuts! Many make-believe camping trips and star gazing sessions have taken place so far, can’t wait to see what else they dream up! A zone I didn’t include in this space was an area for art…I kept that contained to their under the stairs homework | art closet that you can see HERE. 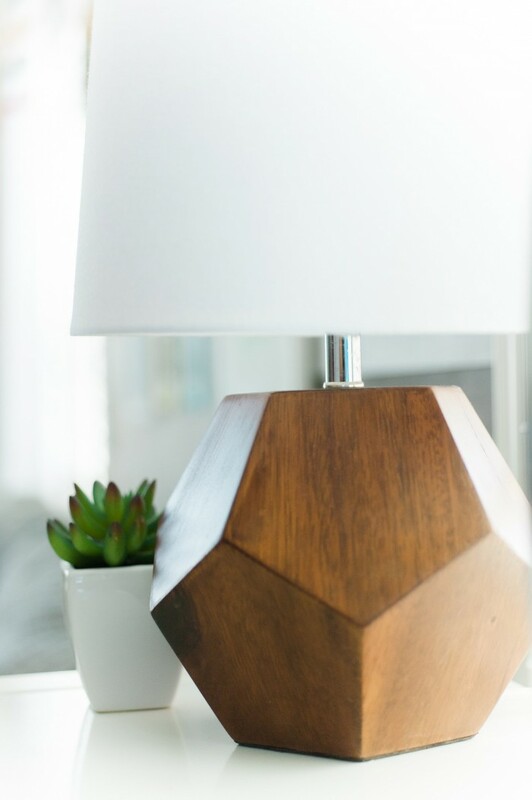 I loved bringing in some natural finishes and textures and this geometric table lamp was the perfect item for that! 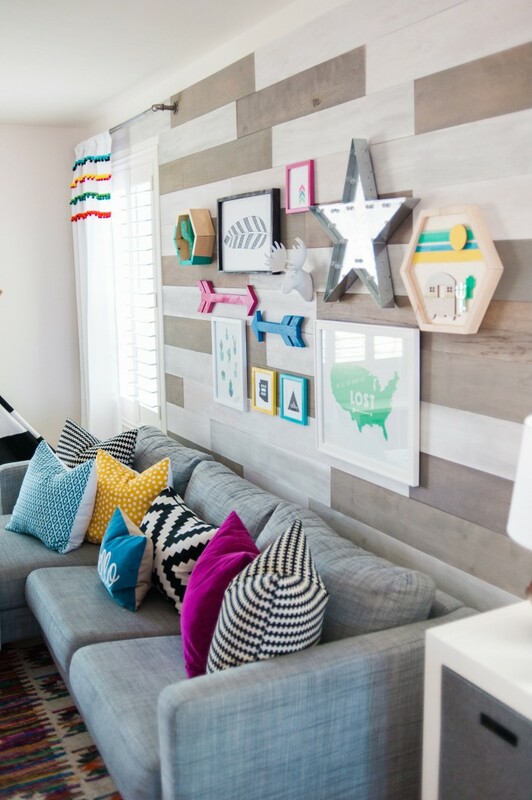 I love how it looks against the DIY Plank Wall!!! So, when designing a kids playroom, I think it is important to design a space that will grow with them, my boys are 4, 6 and 8 and there are specific zones that appeal to their individual interests. It is also a good idea to design with a theme that can grow with them. 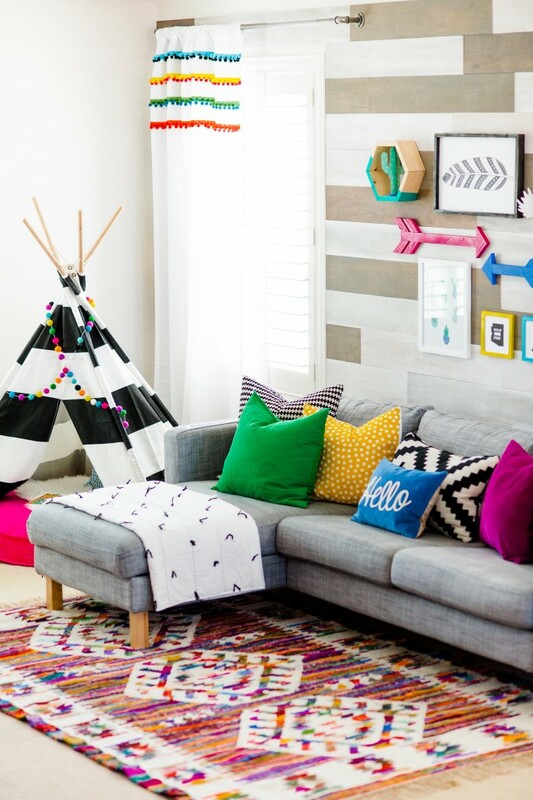 Bright playful colors and lots of texture was the goal and I think it all came together amazingly with The Land of Nod’s awesome products! This is a space not only my boys can enjoy but the whole family can too! 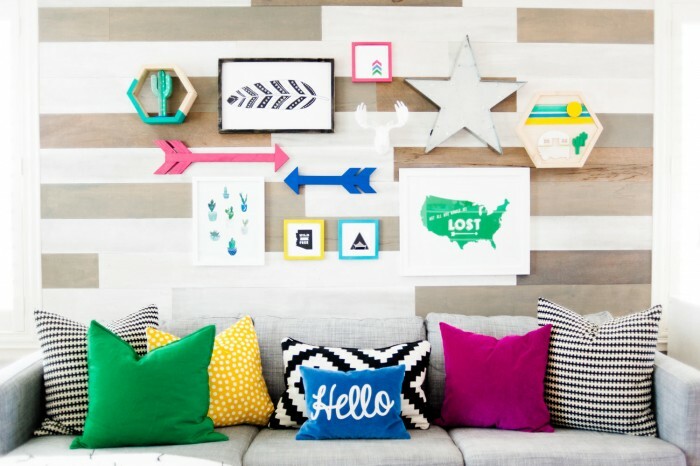 Make sure to follow The Land of Nod on Instagram HERE and Petite Party Studio HERE!!!! 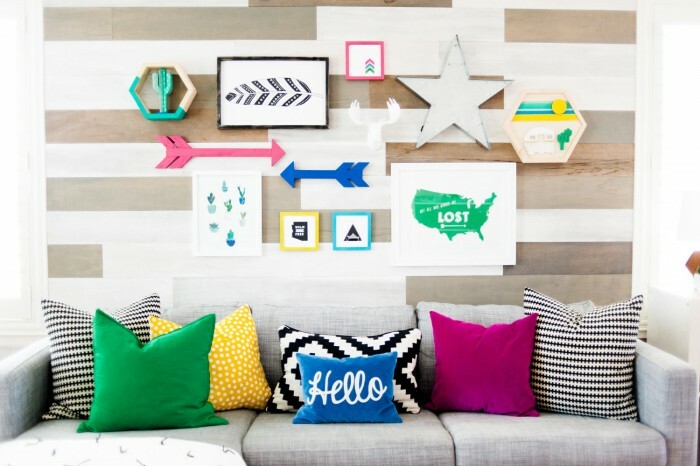 We will be sharing the DIY Plank wall, plus a few other DIY project from this space and you’re not going to want to miss it!!! Thanks for stopping by! 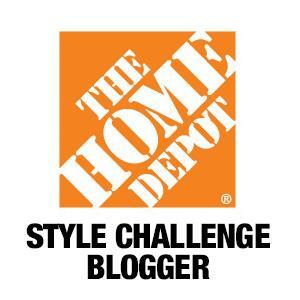 Disclosure | Thank you to The Land of Nod for sponsoring this post. All opinions and ideas are my own. 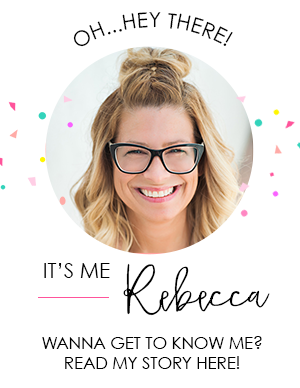 Hi!!!! 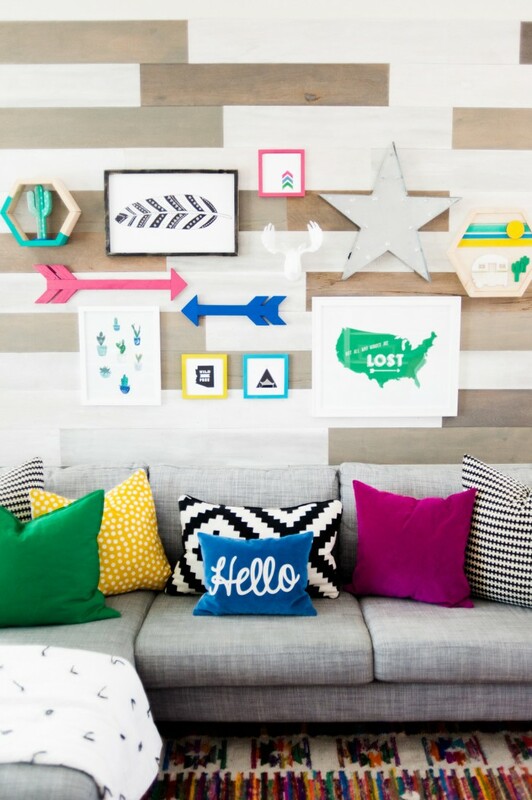 where can I find the pink arrow/wall art and cactus pillow? 😉 Couldn’t find any links or tags. Thanks in advance! Awe, thanks!!! Both of those projects were things I made!!! I will have some available to purchase soon!!! I think the blue “Hello” pillow is my favorite part!!! 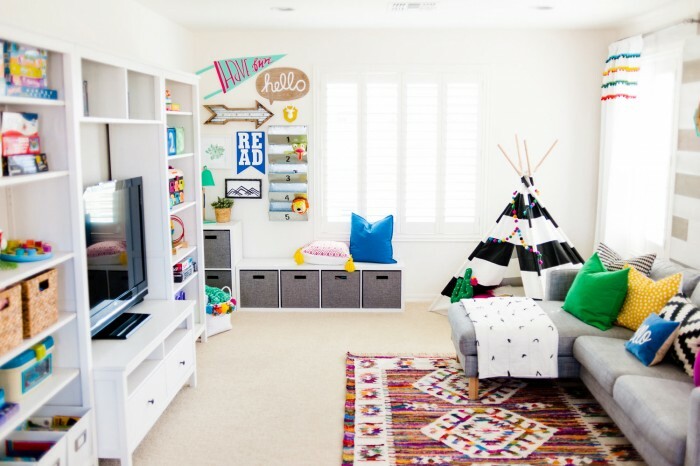 Love your playroom! 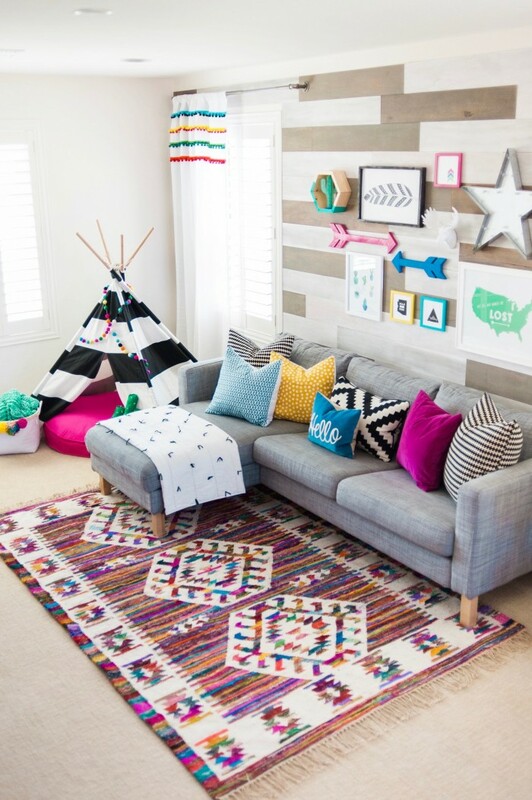 Where is your sectional couch from? Thanks! I love your playroom. You did a great job! 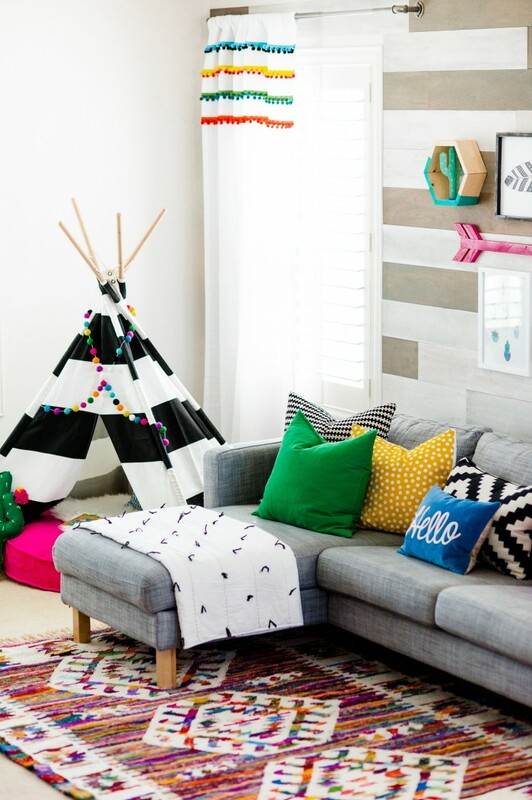 Can you share where to find the colorful curtain. It’s so fun! Thanks! Hi! Where is the wall unit from?